A lot of things can dull the appearance of teeth. Coffee is a major culprit as is juice and tea. In order to brighten up the mouth by whitening teeth, some people think at-home teeth whitening kits can be a good alternative to going to the dentist. As this article shows, though, this actually isn’t a very good option. Dentists say that the do-it-yourself teeth whitening kits do next to nothing. Even the best ones won’t whiten between teeth they say. They can also result in serious oral problems including irritated gums, sensitive teeth, and thinning enamel. Dentists agree that if you do want whiter teeth and a better smile a trip to the dentist is going to be called for. As the Wikipedia article on teeth whitening shows there are a number of different methods dentists can use to help their patients get gleaming white teeth. 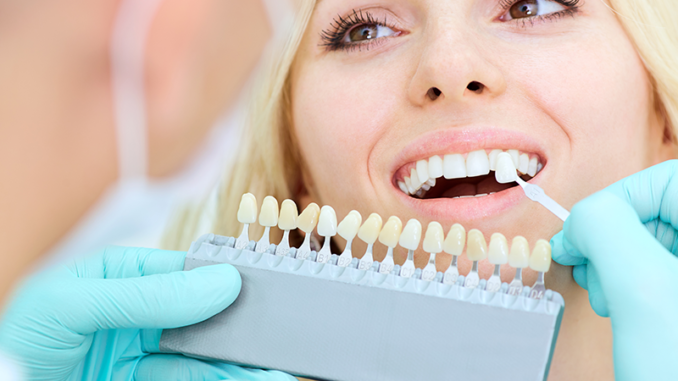 A dentist can either whiten teeth to their natural state or go beyond that to an even more white appearance. One way they can whiten teeth is by simply removing things that have built upon them. This includes tobacco smoke, coffee, wine, and tea. They will also remove tartar that has built up. Bleach is the tool that dentists generally use to whiten teeth. They will use different techniques to apply the bleach including pens and strips. 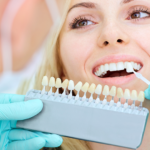 In many cities, like those looking for teeth whitening Naples FL, there are dentists who will use a laser tooth whitening process. They will also use a device that moves the whitening process along faster which shines light onto the teeth. In general, women will have naturally whiter teeth than men. The reason for this is that they usually have smaller teeth which don’t contain as my dentin as men’s teeth tend to do. Dentin is a darker material behind the tooth enamel. It’s for this reason that back teeth like molars are naturally darker than front teeth as well. Older people have also built up minerals in their teeth which make them appear darker. Before starting the teeth whitening process the dentist will do an examination. They review the patient’s health and dental record and then look at both the hard and soft tissue inside the mouth. They can also take x-rays which shows what it going on inside each tooth that might be leading to its discoloration. Once the dentist has whitened a person’ teeth they can expect them to stay that way for several months. This can last a shorter time if a person continues to drink a lot of red wine, coffee, or tea or if they are a smoker. People who want to maintain whiter teeth usually have the process done each year. A recent innovation in the dental industry is using a new bleaching agent which is a mixture of hydrogen peroxide and titanium oxide nanoparticle. After this mixture is placed on the teeth the mouth is exposed to a specialized light source which causes the hydrogen peroxide to rapidly break down. This causes the teeth to quickly whiten with the patient out the door within 30 minutes.